When I first started my year-long human powered challenge, Powered by Me, the rules were simple. But, I never imagined the challenges I would face along the way. The places I would need to get to human-powered. Whether or not I could physically do it. If I had enough time. If I could keep the challenge up for a whole year. The ‘what’s’ and ‘if’s’ seemed endless at the beginning. But as time went on these doubts were diminishing. Over the past 302 days I have travelled over 7,704 kms (or 4,600 miles) human-powered, by cycling, running, walking and more recently skating (or trying to). That’s more than the distance of London to Havana by plane (7,502 kms). I’ve travelled to weddings, hen do’s, work conferences, birthday parties, a trail running race, a sportiv, a festival and more, only using my body to get me there and back. Powered by Me so far has taken me to places in the UK and Europe I’ve never been to before. BUT, there have been some exceptions to the rules, of which I want to fess up and share with you now. In June 2017, I was approaching a good friends wedding. Trouble is, it was all the way in Carcassonne, Southern France, close to Spain. 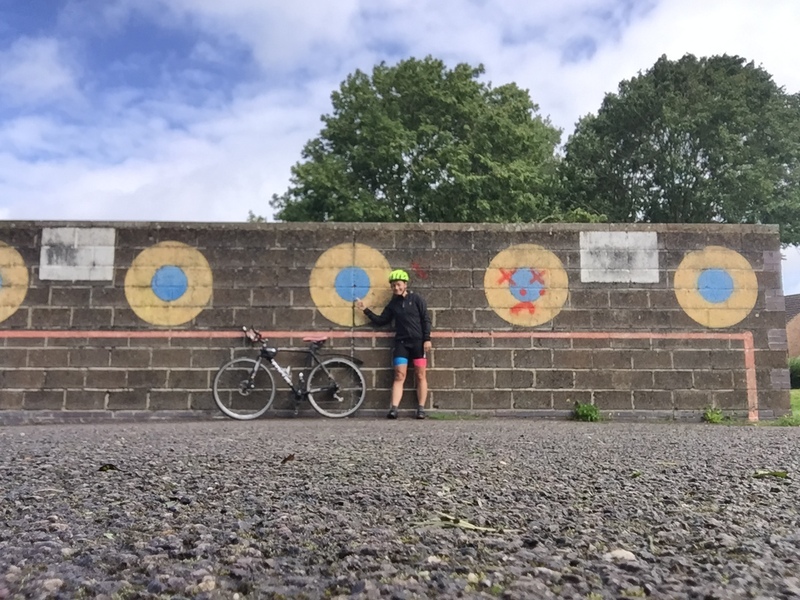 Earlier in the year I was over-confident thinking, ‘I’ll just cycle it.’ When I sat down and figured out the distance and time it would take to cycle to Carcassonne and back (over 1,300 miles in total), I just knew I couldn’t. If I had a few more week’s annual leave I could have done it. I quickly came to the realization that all my annual leave had already been ring fenced to ride to and from other weddings, hen do’s and the like. So this wedding, had to be the only exception. I was gutted. I had to take a plane to get to the wedding and be in a car the other side to get to places. In my head, the rules had been broken. After a bit of sulking I decided to quash the negatives as they clearly weren’t going to get my anywhere and decided to look back at all the positives, as well as looking ahead at what was to come – still several months of Powered by Me challenges. So I decided to accept that it was OK to have a few exceptions. I’d completed so many months of Powered by Me that I could allow myself a weekend off. And the compromise was that I had to cycle to and from Stansted airport. I also decided that I had to publicly state that I had travelled some places not-Powered by Me. A confession if you like! So here goes. Here are my not-Powered by Me journeys. So there it is. I’ve bared all and fessed up. Have I failed? No. Have I broken the rules? A bit (and only for a weekend). Is it all over? No. Is it still the most testing thing I’ve ever done? Yes. Is it still impressive? Yes (even if I say so myself). By allowing myself a break and not thinking negatively about these not-Powered by Me journeys, I’ve accepted it for what it is and moved on. The next 63 days – any more exceptions? With only 63 days to go until I complete by Powered by Me challenge, I hope there are no more occasions where I can’t travel human-powered. Thankfully I still have my mental and physical health. I am even more determined than ever before and it feels good to be on the home straight (almost). But…watch this space.